very inconvenient for them because they are exposed to the heat and dust. This is the type of machine layout that the other water stations have. The machine is wall mounted thus all piping and wirings are visible to the customers, which makes it unappealing and unsanitary. Our machine is encased in stainless steel and skid-mounted which makes it more appealing to the eyes. To be competitive and to penetrate the market, Aqua 2000 is very proud to say that we have our own bottling plant in Laguna. All products from this plant are BFAD approved. friendly mascot will surely capture the attention of young and old alike. This will make your store's existence known in the area. 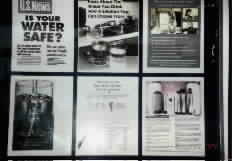 Exhibits posted inside your store will entertain and educate your customers while waiting for their refills. This will let them feel the importance of drinking healthy water. Compared to other franchisees, which upon installing your package, you are on your own. With us, you will enjoy the convenience of sharing your Main office's ad campaigns for the success of each Aqua 2000 franchise. We always presume that you, as franchise owners don't have a background in water business, so we will conduct an extensive training for you and a separate hands-on training for your service crew which will include delivery, refilling and how to prepare the daily shift record and other reports. We will also help you in processing your DTI permit, Barangay Clearance, and Mayor's Permit. Our service engineer will visit your place to check if your machine is fully operational. (telefax) or through our cellphone number (917) 607-1952 for more details. Copyright � 2002. AQUA 2000 Water Technology Incorporated.